FILE - The U.N. envoy for Libya, Ghassan Salame, speaks during a news conference in Tripoli, Libya, April 6, 2019. The United Nations said Tuesday that a national conference for Libya scheduled for Sunday to bring warring parties together is unlikely to go ahead due to the military escalation in Tripoli. The envoy said he would “work day and night” to end the current military escalation, which began last week and has left dozens of civilians dead, including two doctors. 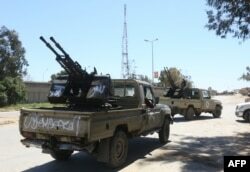 Gun-mounted vehicles belonging to fighters loyal to the internationally recognized Libyan Government of National Accord (GNA) are pictured near a military compound in a suburb of the capital Tripoli on April 9, 2019. 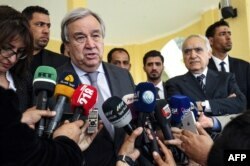 FILE - United Nations Secretary-General Antonio Guterres, left, speaks to the press before departing from Benina International Airport in Libya's eastern city of Benghazi, April 5, 2019. Earlier this week, U.S. Secretary of State Mike Pompeo called for an immediate halt to Haftar’s advance and said all of parties involved "have a responsibility to urgently de-escalate the situation."